As a child I was born with many medical problems so while my brother and sister were out playing basketball or riding their bikes, I was with my mom while she took care of me. My mom would always watch the Food Network and make elaborate dishes for my family of five. My day would consist of school in the morning, watching my mom cook, watching Emeril Lagasse cook, watching my mom cook again, followed by more Food Network and repeat day after day. A few years later I was helping her in the kitchen, cutting vegetables or whisking up a storm. By age seven, I was baking cookies on my own and even grilling. More recently, I have had multiple ear surgeries and have been stuck at home for weeks at a time. The only thing that makes me feel like myself again while recovering is spending as much time as possible in the kitchen. In elementary school while everyone my age said they wanted to be a firefighter or an astronaut, I always said I wanted to be a pastry chef. I have had sketches, menus, and a location programmed into my mind for as long as I can remember. Food is my inspiration and the reason I wake up every morning with a smile. I chose the CIA because of its reputation for being the best of the best. Receiving a well-rounded degree was very important to me and that is exactly what I am working on right now. I am learning every single aspect of the pastry world and I am forever grateful for this level of education. Scholarships have made one of the best culinary schools in the world very affordable and without them I would not be here today. Honestly, the people I am surrounded by. I went to the same high school for four years and I have been at the CIA for less than five semesters. In this short year and a half, I have made a new family here. I feel like I have known the staff my whole life, and my classmates are as close to me as my siblings. Everyone around me has the same burning passion and ambition as I do, which is my favorite part about being here. I could not picture my life anywhere else besides right here at Greystone with my new family. Do you belong to any clubs or participate in any activities on campus? I currently am a group leader and tutor, and I occasionally help with special events and conferences on campus. Being a tutor is one of the most rewarding jobs there is because I get to see my peers grow right before my eyes; having been a part of their journey at this school warms my heart. Group leader has taught me all about responsibility and has helped me gain so much confidence in myself. Finally, working with special events is not about the money at all. It is all about the experience and exposure to many different challenges. My favorite dish to make is chocolate chip cookies. It’s the simple dishes that bring the biggest smile to someone’s face. Flour, eggs, butter, sugar, and chocolate are all it takes and it’s all about the simplicity. At the CIA I have learned how to make the most complex desserts and dishes, but the uncomplicated treats are the ones that connect with everyone. Before coming to this school the business side of food never even crossed my mind. Working front of house and taking menu development classes have taught me so much priceless information about this field that no other school could have. Always have a smile. Being in a kitchen for 10+ hours a day can really drain you and always having a positive attitude will make the day so much better. Being around people who have a similar mindset makes it so much easier because suddenly the 10-hour day just passes right by. My end goal is to be the executive pastry chef at a five-star hotel. My CIA education already has my foot in the door because of my externship. I had the opportunity to extern at one of the finest hotels in America and without the CIA that would not have been possible. Life is short—do not regret anything. I was so nervous about coming to the CIA and it is the best decision I have ever made in my life. I have been here for almost two years and it just flashed right by. I now graduate in just a few months and I still go to bed giggling with excitement every night. I have literally never worked harder for anything in my life, but I truly enjoy what I am doing and it does not feel like work at this point. The CIA is the only option there is and I am forever grateful that I made it my home. 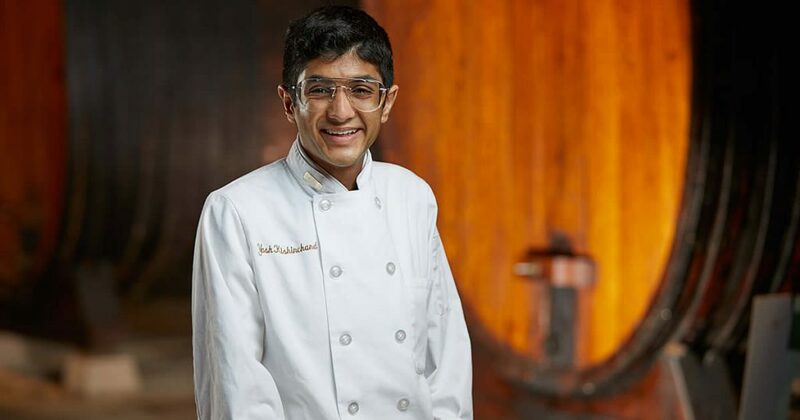 Yash Kishinchand is a CIA student pursuing his associate degree in baking and pastry arts at the CIA’s Greystone campus in St. Helena, CA (Napa Valley). He is from Dayton, Ohio.